Stonepine Estate has a number of things working in its favor. The former estate of the Crocker banking family is not only the largest equestrian complex this side of Churchill Downs, it's also nestled in the heart of the Carmel Valley  noted for Zen centers, wineries, organic farms and its adjacency to Carmel-by-the-Sea, sans fog. You can be allergic to thoroughbreds and still love Stonepine if you enjoy classic country living, surrounded by 330 oak-studded acres, only thirteen miles from the Pacific Coast Highway and 25 minutes from Monterey Airport. 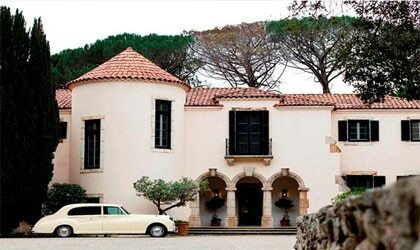 For years the estate has served as a site for special events, celebrity hide-outs, glittering weddings and corporate retreats. Now it's reaching out to the leisure traveler seeking solitude and luxury in a setting more European than Europe itself. As you drive through the wrought-iron double gates, you could easily be in an ancestral estate in Sussex, a duke's manor in Dordogne or a Medici's villa in Tuscany. The main building, Chateau Noel, features a living room, dining room and library with eighteenth-century fireplaces against walls of nineteenth-century oak in the Provincial style. Pillars supporting the loggia are made of nineteenth-century carved stone. No matter how modern the amenities, Stonepine still reflects a time when refined taste flourished and price was no object. Chateau Noel consists of eight luxury suites: Chanel, Polo, Cartier, Don Quixote, Venetian, Taittinger, Wedgewood and Dong Kingman. They are lavishly furnished in themes inspired by the celebrated designers. Popular with brides is the Taittinger with its satiny decor. Don Quixote has its own private garden. 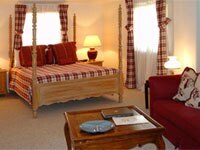 The Venetian suite overlooks the Cherub on the Swan gardens and is ideal for a romantic getaway. Wedgewood offers a fireplace and chaise lounges. Dong Kingman has a full marble bath overlooking the rose garden below, as well as several of the artist's works. There are numerous cottages on the rest of the property that are perfect for families and celebrity couples seeking the ultimate in privacy. The Equestrian Center and adjoining Paddock House provide a beautiful setting for Western Barbecues, complete with riding lessons, hay-strewn wagon rides, group games such as sack races and archery, and live music. So after a weekend of solitude, wildflower-scented hiking trails and Limoges, you can forget Europe. Just call Stonepine the world's most elegant dude ranch. 150 East Carmel Valley Rd.